Fibre Channel (FC) is a gigabit-speed networking technology used nearly exclusively as a transport for SCSI. FC is one of several block protocols supported by the appliance; to share LUNs via FC, the appliance must be equipped with one or more optional FC cards. By default, all FC ports are configured to be in target mode. If the appliance is used to connect to a tape SAN for backup, one or more ports must be configured in initiator mode. To configure a port for initiator mode, the appliance must be reset. Multiple ports can be configured for initiator mode simultaneously. Each FC port is assigned a World Wide Name (WWN), and -- as with other block protocols -- FC targets may be grouped into target groups, allowing port bandwidth to be dedicated to specific LUNs or groups of LUNs. Once an FC port is configured as a target, the remotely discovered ports can be examined and verified. Refer to the Implementing Fibre Channel SAN Boot with Oracle's Sun ZFS Storage Appliance whitepaper at http://www.oracle.com/technetwork/articles/servers-storage-admin/fbsanboot-365291.html for details on FC SAN boot solutions using the Sun ZFS Storage Appliance. In a cluster, initiators will have two paths (or sets of paths) to each LUN: one path (or set of paths) will be to the head that has imported the storage associated with the LUN; the other path (or set of paths) will be to that head's clustered peer. The first path (or set of paths) are active; the second path (or set of paths) are standby; in the event of a takeover, the active paths will become unavailable, and the standby paths will (after a short time) be transitioned to be active, after which I/O will continue. This approach to multipathing is known as asymmetric logical unit access (ALUA) and -- when coupled with an ALUA-aware initiator -- allows cluster takeover to be transparent to higher-level applications. Initiators are identified by their WWN, and as with other block protocols, aliases can be created for initiators. To aid in creating aliases for FC initiators, a WWN can be selected from the WWNs of discovered ports. Further, and as with other block protocols, initiators can be collected into groups. When a LUN is associated with a specific initiator group, the LUN will only be visible to initiators in the group. In most FC SANs, LUNs will always be associated with the initiator group that corresponds to the system(s) for which the LUN has been created. 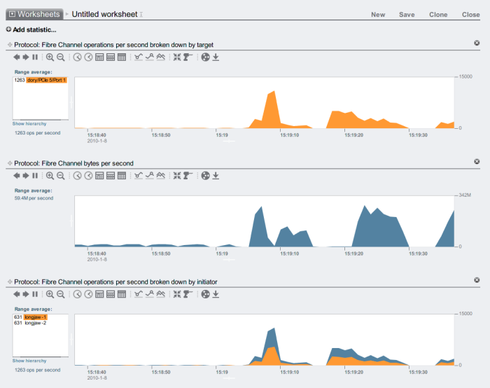 As discussed in target clustering considerations, the appliance is an ALUA-compliant array. Properly configuring an FC initiator in an ALUA environment requires an ALUA-aware driver, and may require initiator-specific tuning. For operations, one can also breakdown by offset, latency, size and SCSI command, allowing one to understand not just the what but the how and why of FC operations. While the possibility of queue overruns is remote, it can be eliminated entirely if one is willing to limit queue depth on a per-client basis. To determine a suitable queue depth limit, one should take the number of target ports multiplied by the maximum concurrent commands per port (2048) and divide the product by the number of LUNs provisioned. To accommodate degraded operating modes, one should sum the number of LUNs across cluster peers to determine the number of LUNs, but take as the number of target ports the minimum of the two cluster peers. For example, in an active-active 7420 dual headed cluster with one head having 2 FC ports and 100 LUNs and the other head having 4 FC ports and 28 LUNs, one should take the pessimal maximum queue depth to be two ports times 2048 commands divided by 100 LUNs plus 28 LUNs -- or 32 commands per LUN. Tuning the maximum queue depth is initiator specific, but on Solaris, this is achieved by adjusting the global variable ssd_max_throttle. To troubleshoot link-level issues such as broken or flakey optics or a poorly seated cable, look at the error statistics for each FC port: if any number is either significantly non-zero or increasing, that may be an indicator that link-level issues have been encountered, and that link-level diagnostics should be performed. To make use of FC ports, set them to Target mode on the Configuration > SAN screen of the BUI, using the drop-down menu shown in the screenshot below. You must have root permissions to perform this action. Note that in a cluster configuration, you will set ports to Target mode on each head node separately, see the clustering considerations section. After setting desired ports to Target, click the Apply button. A confirmation message will appear notifying you that the appliance will reboot immediately. Confirm that you want to reboot. When the appliance boots, the active FC targets appear with the icon and, on mouse-over, the move icon appears. Click the info icon to view the Discovered Ports dialog where you can troubleshoot link errors. In the Discovered Ports dialog, click a WWN in the list to view associated link errors. Create and manage initiator groups on the Initiators screen. Click the add icon to view unaliased ports. Click a WWN in the list to add a meaningful alias in the Alias field. On the Initiators screen, drag initiators to the FC Initiator Groups list to create new groups or add to existing groups. Click the Apply button to commit the new Initiator Group. Now you can create a LUN that has exclusive access to the client initiator group. 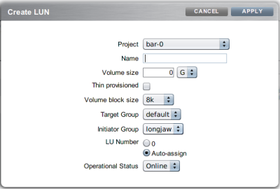 To create the LUN, roll-over the initiator group and click the add LUN icon. The Create LUN dialog appears with the associated initiator group selected. Set the name and size and click Apply to add the LUN to the storage pool. dory:configuration san fc targets> set targets="wwn.2101001B32A11639"
The following example demonstrates creating a LUN called lefty and associating it with the fera initiator group. Refer to the CLI Usage and Simple CLI Scripting and Batching Commands sections for information about how to modify and use the following example script.